5) Real-time communication systems were installed so that transit riders could check arrival times by cell phone. The colouring scheme goes a long way towards helping riders know exactly where their bus is going. It’s very simple. Blue buses travel long distances on major arterial roads, serving more than 2 districts, and run in median bus lanes when they get close to the centre of the city (this video shows a blue bus entering a separated median lane). Green buses operate as feeder buses to the 8 lines on the subway system and are run by private companies. Red buses are express routes with limited stops connecting major suburban towns to the central city. And yellow buses are circular routes that travel between the major destinations in the central city. Blue and red buses are the same price, while the red (suburban) buses cost more and the local yellow buses less. But the addition of a route numbering system that actually has explicit meaning is something every transit system should adopt. First they divided Seoul into 8 numbered zones, starting at 0 in the downtown core and giving the surrounding zones numbers 1 through 7. Then they used these zones as part of the route numbers. Blue buses have three-digit route numbers. The first number indicates the origin zone and the second number the destination zone, with the last number the bus ID number. So if you encounter bus #048, for example, you know it travels from downtown (zone 0) to zone 4. Red buses put a 9 in front to indicate that these are suburban routes, while yellow buses have only two numbers, since they stay within the same zone. Paul Krugman (who famously models transportation as an iceberg (and he got his “Nobel” prize in economics for his work in spatial economics and trade theory, showing how aspatial the field is in general), writes about: Trains, Planes, and Automobiles. There are several problems with this image. First it assumes you are already at the train station waiting to board, as opposed to somewhere randomly in the region. Remember most people do not work or live downtown (even in New York City). Second it ignores the third mode of the title (automobiles). A redrawn figure, which is standard in transportation economics or geography, is shown below. 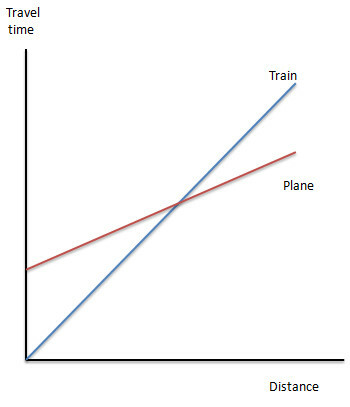 [Similar graphs apply to freight, just change it to Trucks, Trains, and Ships]. The question is whether there is a range between d1 and d2, that is, does rail actually dominate both autos and planes over any region. In terms of travel time it probably does, and looking only at operating cost, it might. In terms of overall cost, including the fixed cost of construction of a new HSR line, it probably does not under current cost structures. The size of this range, if it exists, is, however, empirical, and subject to change with costs and technologies. Infrastructurist picks up on Fix-it-First [the article also notes that traffic was up 20.5 billion miles (total VMT) from the previous year (about 0.67%), it should be noted that this is less than the population growth in the US (about 1%)]. So does Crossroads Blog Smart Growth Round-Up: Livable Cities and Transportation. Cities are positive feedback loops in space. Cities exist only because it is more important for people and organizations to be near each other than far from each other. There has been recent chatter (Ryan Avent again) about agglomeration making cities wealthier, and only if densities were higher would more agglomeration benefits be achieved. Cities with firms that are more agglomeration-benefitting produce higher densities; cities with firms that are less agglomeration-benefitting produce lower densities. In other words, density is the effect of agglomeration economies, rather than the cause of agglomeration benefits. The agglomeration-benefits of an industry change over time, and are more important when an industry is young, and in the growth phase than when it is old, mature, and locked-in. This hypothesis imples, e.g., increasing densities in Phoenix will not suddenly make Phoenix more productive because the firms in Phoenix don’t benefit much from the additional clustering (and disbenefit from the negative externalities of density such as crowding, pollution, congestion, and the higher costs of services and land that accompany high density). A city like New York or London, in which the Finance Industry (among others) locates, or Washington in which the Government Industry locates, benefits more significantly from the daily walking distance, face-to-face interactions possible by agglomeration. However even in those capital cities there may be limits to agglomeration such that the marginal benefits of an additional person or job may not outweigh the marginal cost. Since there can only be one national capital per nation, and perhaps one financial capital per nation, the opportunities for creating financial mega-cities of the order of New York, London, Paris, Tokyo, etc. are limited, just as there can only be one effective political capital; second order cities will not magically become first order just by increasing their density. To take a case I am familiar with, Minneapolis, downtown has not seen much new commercial growth in over a decade, though there has been a significant (though regionally relatively small) increase in residential density. Minneapolis might be termed a provincial capital. It has a large hinterland, a Federal Reserve Bank, many regional and national bank operations (Wells Fargo, US Bank, etc. ), and a large number of headquarters of large firms (regionally especially, though many are not downtown, Target, Best Buy, General Mills, 3M, Medtronic, etc. ), as well as emerging clusters in a few economic sectors. In Downtown there are plenty of vacant lots (i.e. parking lots) for development to occur, and no real constraints on new office (or residential) construction downtown. Clearly the private benefits of building downtown are not as great to the firms making location decisions as locating that new building in suburban areas. Unlike New York, the zoning downtown is not a binding constraint. In brief, the private share that firm will attain from agglomeration benefits of the CBD do not outweigh the costs, (including the opportunity cost of building in some other locale). Those suburban places too have some (weaker) agglomeration benefits, but those may be sufficient. The location within a metro-area still produces benefits (which are weaker than the CBD benefits on daily walking distance face-to-face metric, but still enable daily or weekly driving distance face-to-face), such as shared labor pools, and all that. If there are agglomeration benefits of locating downtown, they are not sufficient that the local firms (acting through local government) bribe these non-CBD locating firms to move downtown to enable those spillovers. Only a few cases where the spillovers are believed strong result in sufficient side payments (bribes, tax increment financing, etc.) (the Minnesota Twins and the Target HQ building come to mind). The Twin Cities has some tax-based sharing, so may differ from other regions in the local willingness to bribe, but it also suggests that if agglomeration benefits exist for the marginal new business choosing a location, they are relatively weak. The mental model of agglomeration producing huge benefits if only density limits (as in New York and Washington) were lifted may not apply in many other cities.